Habitat: Rocky bluffs, barnyards, gardens, and sidewalk cracks. Prefers disturbed areas; common in city lots. Description: Succulent with thick round leaves, forms a sprawling matt about two feet across. Reddish succulent stem about six inches long. Small yellow flowers bloom from midsummer to early fall. George Washington ate weeds. That is, he ate what he thought of as garden vegetables: Martha’s Booke of Cookery and Book of Sweetmeats includes a handwritten recipe for Pickled Pursland. The manuscript was copied down anonymously in 17th-century Britain an ancestor of her first husband, Daniel Parke Custis. The book, a gift to Martha from him in 1749, also contains a “receipt” for Pursland Syrup. Purslane is probably a Eurasian plant that spread west as humans did, introduced to North America by early settlers as a food source. Recipes for it remained common in American cookbooks until the twentieth century. Some of you may remember your grandmothers fixing it as a salad green or a vegetable side dish. Then what happened? How does an ingredient disappear in just a generation? How did it go from garden crop to a plant to be pulled from beneath the vegetables in your garden–an unwelcome invader in your lawn, in the cracks in your patio and walkways, a weed so successful it earns the USDA’s highest rank of contempt, “noxious”? It’s one of the tastier invaders, a crisp succulent (think: a miniature jade plant) with a lemony tang, then a peppery kick. These days purslane is making its way back to the dinner table. It’s even spread into farmers’ markets and fancy restaurants. 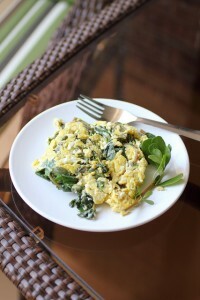 It turns out to be a “superfood,” high in Omega-3 fatty acids and beta carotene. There is fossil evidence that purslane was in the New World before Columbus arrived. Pollen grains have been found in southern Ontario that date back to the 1430s. In North America, in the Early and Middle Archaic periods (8000-4000 B.C. ), purslane seeds are relatively abundant in some deposits left in the Eastern Woodlands. By the Late Archaic (4000-700 B.C. 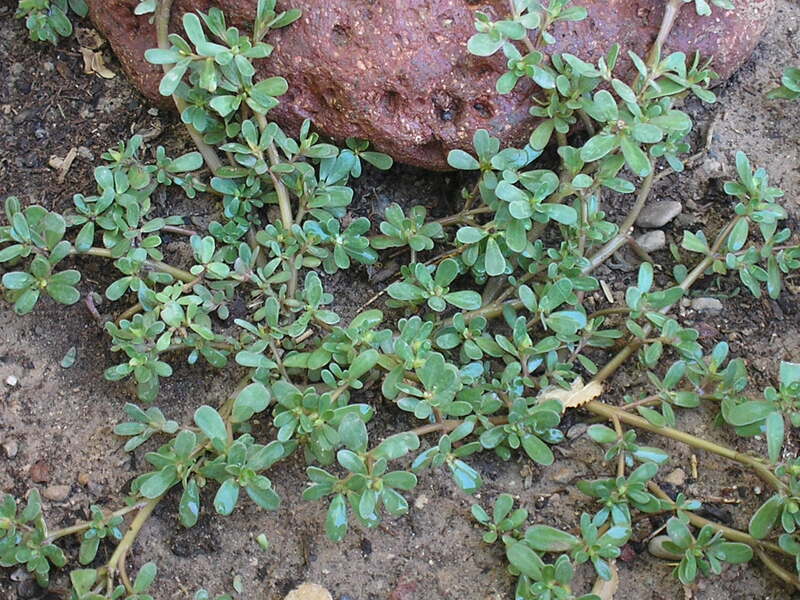 ), among Mississippian peoples, purslane, still being eaten, began to be found where one find weeds: around dwellings and in low-lying damp spots. Yet early settlers almost certainly brought it with them from Europe. The Spanish chroniclers reported purslane as a wild or quasi-domesticated food among the Taino of the Greater Antilles at the time of first contact. In 1605, French explorer Samuel de Champlain’s men investigated Indian cornfields in Massachusetts. 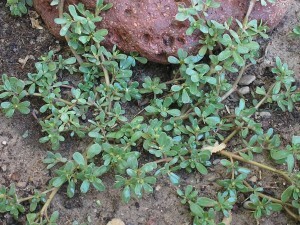 They were surprised to see that the Indians regarded purslane, which covered the ground under their crops, as unusable. (The French regarded it highly as a salad vegetable.) So was purslane native or invasive? If the Indians weren’t eating it, it seems to be the latter. But it appears to have arrived before English settlers. In any event, as the Mexicans know, it makes a fantastic meal. *If you’re a diehard invasivore, restrict your consumption to Hawaii. 1. Chop the purslane, chickweed, amaranth, and onion into bite-size bits. 2. Add avocado, peeled and diced. 4. Mix in cheddar cheese. 5. Squeeze lemon over the salad, add garlic salt, and mix well. “Gather ye pursland when it [is] stalkie & will snap when you break it. Boyle it in a kettle of fayre water without any salt, & when it is tender, make a pickle of salt & water, as you doe for other pickles. 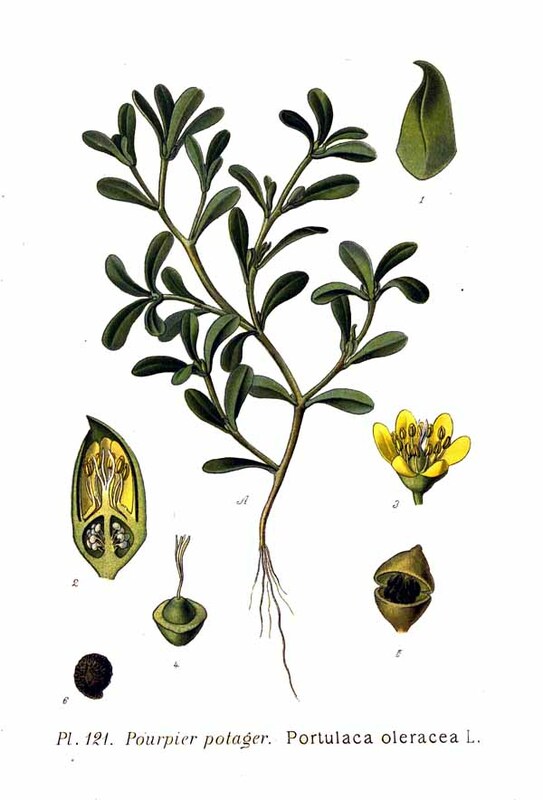 According to Champlain, the Indians of northeastern North America ignored purslane. Not so the indigenous people of Mexico and the Southwestern US. We don’t know when purslane, or verdolago, arrived in the region, but this may be our favorite use of this common invader. 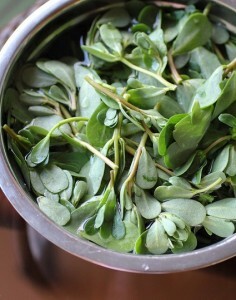 Love purslane! I’ve fried it with garlic in butter and put it in casseroles and potato salad… I’d like to know how to preserve it.pickled? Dried? Any ideas out there? 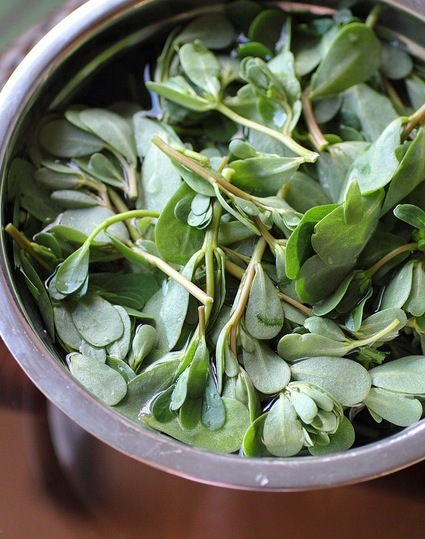 Purslane was eaten by Native Americans long before the coming of Columbus. We are not quite sure how it got here, but the ancient Anasazi of the Southwest were eating a good bit of it, and by some accounts had developed an improved cultivar. Here in Virginia, a state archaeologist told me it was the one plant they could be sure of finding evidence of at every site. Purslane is not an invader. It is found in Anasazi ruins in the Southwest. A state archeologist here in Virginia told me that it was the one thing common to about ever site they carefully studied as far as archeo-ethno-botany. It is possible that they brought it with them from Asia across the land bridge, i don’t know. But it is not an invader. 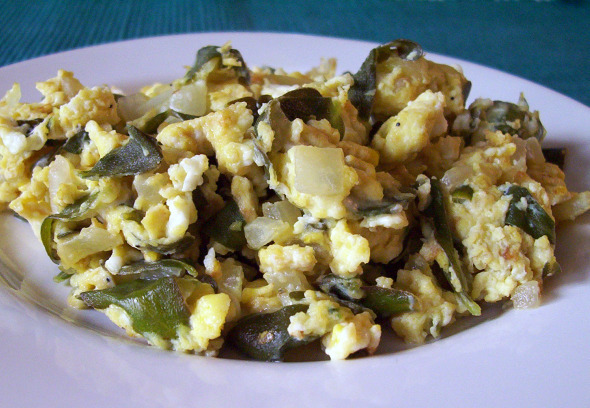 thank you for sharing, found and tasted las vedulagas in Mexico. Went back home AZ and found the in yard,didn’t how nutritional they are too. LOVE everything about this site!! !